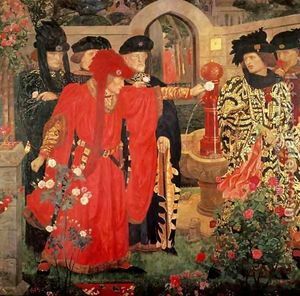 What were ‘The Wars of the Roses’? Most of St.Dysmas’s re-enactment activities center around the wars of the roses, the series of battles for control of England at the end of the middle ages. The conflict is generally considered to have stared with the battle of St.Albans in 1455, and continued though a spasmodic series of battles over the next 30 years. In 1485 the last Yorkist king, Richard 3rd, was killed at Bosworth. As the Lancastrian claimants had also been wiped out by this time, control of the country passed to Henry Tudor, who became Henry VIIth. This marks the start of the Tudor dynasty and the end of the medieval period in England. It’s worth noting that the name ‘The Wars of the Roses’ was probably never used in the period. The name comes from the use of a white rose as a symbol of Yorkshire, and a red rose as a symbol of Lancaster. Shakespeare makes use of these symbols is in Henry IV part 1, but the name doesn’t seem to be used prior to Sir Walter Scott in the 19thC.